"A witty, scientifically accurate, and often intensely creepy exploration of sanguivorous creatures." For centuries, blood feeders have inhabited our nightmares and horror stories, as well as the shadowy realms of scientific knowledge. 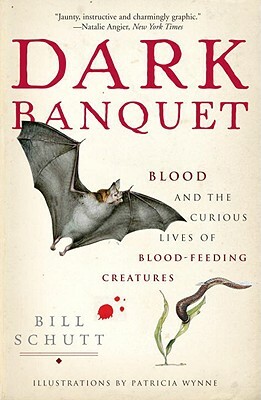 In Dark Banquet, zoologist Bill Schutt takes us on a fascinating voyage into the world of some of nature’s strangest creatures–the sanguivores. Using a sharp eye and mordant wit, Schutt makes a remarkably persuasive case that blood feeders, from bats to bedbugs, are as deserving of our curiosity as warmer and fuzzier species are–and that many of them are even worthy of conservation. Enlightening and alarming, Dark Banquet peers into a part of the natural world to which we are, through our blood, inextricably linked. "Dark Banquet is an amazing account of all those creatures that most of us consider really creepy! But author Bill Schutt doesn’t, and actually embraces these critters and their bloodthirsty lifestyles. It’s great to see such wonderful animal research in a reader-friendly form. After finishing the book, you’ll have a lot to discuss at your next dinner party!" "[A] passionate defense of bloodsuckers from the leech to the candiru." BILL SCHUTT is an associate professor of biology at C.W. Post College in Long Island and a research associate in mammalogy at the American Museum of Natural History in New York. "Zoologist Bill Schutt, through witty, informed writing, transforms bloodsuckers into enticing creatures." "What starts out as a horror movie of a book morphs into an entrancing exploration of the living world. Bill Schutt turns whatever fear and disgust you may feel towards nature's vampires into a healthy respect for evolution's power to fill every conceivable niche. And once you're done, you'll be spoiling one dinner party after another retelling Schutt's tales of bats, leeches, and bed bugs."